About once a season, Parks And Recreation does an episode in which the characters realize just how much Leslie Knope does and learn to appreciate her even more. Maybe it’s penance for the poor-person’s Michael Scott she had to play during season one before the writers tweaked her to become infinitely more likable. But whatever the case, it serves a dual purpose. People on Parks learn to love their leader even more, and it’s damn entertaining to watch the beloved rest of the team flounder in situations they’d never be a part of. But “Emergency Response” is anything but formulaic. As the show has evolved, it has retained its memory. Leslie has been out of the picture enough times that, slowly but surely, her friends have learned what to do in her absence. Tonight, she is in desperate need of $50,000 to save her parks project, so she and Ben decide to throw a black tie fundraising gala. The day of the event, Pawnee is hit with an emergency drill issued by fellow Upright Citizens Brigadier Matt Walsh. Leslie is locked away with Ann and Chris, with the other members of the team left to fend for themselves. Cowritten by Joe Mande as his debut—he’s also the best person on Twitter, hands down—“Emergency Response” is deft. The show is only 21 minutes long, and after about 17 minutes, Leslie has exited the drill, and the party is underway. In the interim, a whole lot happens. The drill is found to be the nefarious work of Councilman Jamm, who specifically requested this day and asked Walsh’s Leonard to run Pawnee through the ringer in the hopes he’ll someday be able to sell Greasy Lard Bombs out of the Paunch Burger. Realizing there’s a plot afoot, Leslie hatches one of her own, killing every resident of Pawnee with the avian flu, just to end things faster. 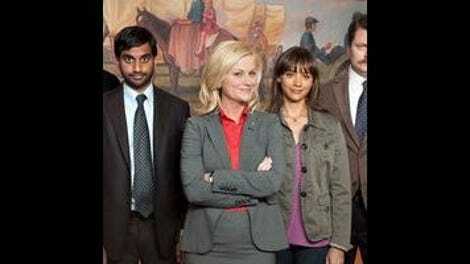 Yes, it’s Pawnee’s 13th straight failing grade in emergency response, but at least she’s out. Also in that interim: Tom secured food vendors for the event; Donna found some chairs; Ron went on Pawnee Today and answered questions about rubbing walnuts on furniture and how haunted houses are the result of loneliness; Jerry fell down. “Emergency Response” strips the episode down for parts, and assembles something truly distinct. So there’s not much time lingering on the logic behind who-goes-where-and-why—when Ron says he can go on TV because he can “speak full sentences, and I won’t cry,” that’s more than enough for Ben to send him off, and the remaining time is spent wisely giving Ron screentime. Meanwhile, Andy is off taking the policeman’s exam, and there are literally only three scenes that tell this entire story, one of which takes place long after he’s failed the personality test (“People always say, '…but he’s got a great personality'”) but received an unprecedented 100 percent on the written exam. It’s enough to feel bad for Andy and wish he’d finally be given that perfect job. Again, this show has a memory like no other, even an emotional one to the point where the episode doesn’t have to remind us why we care about Andy. That leaves a hefty chunk of time at the end, and that’s where “Emergency Response” receives a breather. As a nice change of pace, we’re allowed to take in every moment of the party, listen to a little Mouse Rat, and witness Leslie beaming like a proud parent. It’s the simplest thing in the world, but for a network sitcom to take a deep breath and let things slow to a normal pace, it demonstrates a whole lot of faith in its audience. Much like those who work for Leslie, we’ve developed a similar affinity for this show, and just enjoy being in its world without pretense. It’s the opposite of Councilman Jamm—joke’s on anyone thinking of canceling this show; there are plenty of people on Parks we care about. Now come two sad realizations. Ben, wising up to Leslie’s ways and trying his best to lead with his heart, suggests the two get married right then and there—and for the first time, “To be continued” comes on the screen. This is a bold move for a show looking for longevity; like, think about how they had to insert that annoying boom mic guy into The Office just to create tension for Jim and Pam, who got married a few seasons ago. This sadly feels like a victory lap for a show that might be seeing its final days, despite the best efforts of lowly reviewers. The second comes in that credits sequence where Leslie expands on her fake news segments and plays about five more characters, and decides to include credits sequences. Because 30 Rock is already gone, and as Andy Greenwald pointed out in this awesome Grantland piece, Parks might not be far behind, which means this is also the swan song for Amy Poehler. Watching her do all those characters—not only nailing them, but fake-nailing them in the way Leslie would—is a reminder that it’s not just Leslie who occasionally can be missed on Parks; it’s the actress who plays her, too.